Author Amish Tripathi was a banker for around 14 years. He was keen at reading since early age and eventually he have decided to re-tell mythological tales in the context of “what if he is not just a God but was a human like us who actually wandered the Earth?”. The result of this thought process was The Immortals Of Meluha. The book won both critical acclaimed and commercial success. It made Amish a star author. He then left his job and concentrated on full time writing. And result was two more books in the Shiva Trilogy series named The Secret Of The Nagas and The Oath Of The Vayuputras. Entire trilogy was a big success. Though, we personally, still consider the first book in the series The Immortals Of Meluha as the best among them. He then decided to explore the journey of Lord Ram Chandra (aka Lord Ram or Lord Rama) and the first book penned in the series was Scion Of Ikshvaku. The second book in the series Sita – Warrior of Mithila is just released. Actually an introductory segment of the book is available to read for free as a teaser (Kindle EBook version). This free segment contains introduction and listing of main characters, acknowledgement and first chapter of the book. Once we will complete reading the book, we will definitely publish our views and reviews for the entire book. However for the time being here is what we think about the book by exploring the free content. 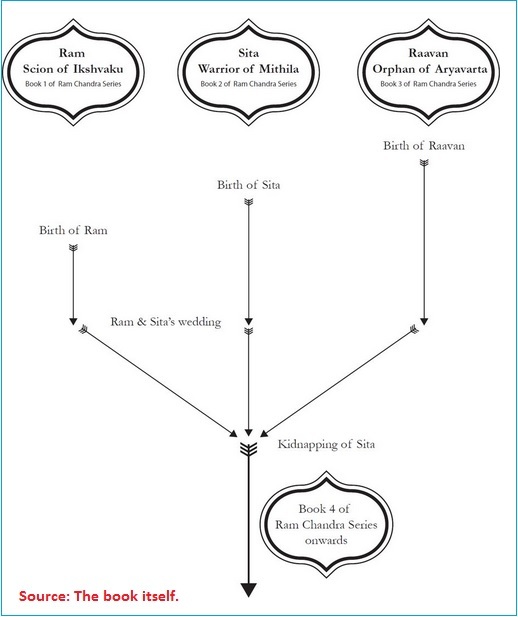 How Ram Chandra book series is planned? One thing we got to know about this book series is the way it is planned. Amish is introducing a new concept called hyperlink in contemporary writing in mythology arena. Then the series will continue with book 4 onwards! The first chapter of this book is the reflection of the same in book 1 of the series, from Sita’s perspective. While Sita, assisted by a Malayputra soldier, was doing her work to bring banana leaves from the jungle, she got wind of something out of cotext. She realizes that their hut was attacked. She furiously runs towards her post and found that Raavan and Kumbhjarna have overpowered the Malayputra soldiers. Will Sita wait for Ram to come before engaging into the battle? Does Raavan know that she is Vishnu? What is the fate of Jatayu? The chapter answer some of them and keep you engage to explore the book to explore the rest of them. However it is tough to predict the book by just first chapter, it clearly gives us the idea of what to expect inside. If the book goes with the pace and quality of this sample chapter, then it is definitely a worth to explore book. Sita‘s character comes out strongly in this chapter. She is a tall and fearsome warrior who has the courage and skills required. If she is not equal to Ram in archery then she is not the one you can ignore at the same time. The qualities of Ram and Lakshman were shown simply by their mention quite effectively. Jatayu‘s character is explored nicely too. The dialogs are simple and yet contains some quality vocabulary as well. The writing (for this chapter) is flawless. Sita cursed in anger. And then realised it was a waste of energy. She looked at Makrant again. He had stopped moving. His soul had moved on. Farewell, brave Makrant. May your soul find purpose once again. Amish is known to integrate the current (political and social both) incidents and happenings in his book to add contemporariness (remember the Nirbhaya incident integrated in Scion of Ikshvaku?). So we might see something about the terrorist attacks / political stuff / currency ban or other stuff included in this book also. Now this is a very important attribute to watch out for, on one hand it work marvel for the book, on the other, it can lead to disaster if not weaven properly. Based on Amish’ skills we can surely expect the better of course. If you have liked previous books by Amish then you may surely like this one too. Otherwise, you may want to wait for a few genuine and unbiased reviews and a good deal at E-commerce website to go for it. We are looking forward to read it and share our reviews with you.